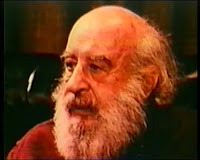 Fritz Perls (1893-1970), a psychiatrist and student of Reich’s, helped found Gestalt Therapy. Gestalt in German means “an irreducible experience,” and Perls adopted the term to name the method he had developed with his wife Laura, also a psychiatrist. Their approach emphasized the person as a whole—with the mind and emotions equally connected to the body—which differed from the importance of “knowing” stressed in Hans-Juergen Walter’s Gestalt Theoretical Psychotherapy. Perls theorized that the exhilarating experience of living fully alive, aware, and in the present was actually derailed by our habitual thinking mind. (“I think, and that gets in the way of who I am”—apologies to Descartes.) Our thoughts about life created a barrier to experiencing life full tilt, and Gestalt therapy emphasized the removal of obstacles that prevented people from maximizing their potential.